Twenty-two boys aged 9-10 were registered to compete at the All Ireland Irish Dancing Championships in Dublin Saturday. Among them were just five North American boys, all who have placed at both the 2010 and 2011 North American National Irish Dancing Championships. Kyle Kohn from Mullane Healy Godley, Connor Labo from Flanagan O'Hare, Collin Mountain from Richen/Timms, Brant Rankin from Mattierin, and Liam Webber from Mulvihill-Lynch represented Middle America, Mid-Atlantic and Western Canada. Sean Slemon from Rinceoiri na Riochta in the Munster region, Ireland is the 2012 All-Ireland Irish Dance Champion for Boys 9-10. Jack Lynch, from Ui She in the Leinster region, Ireland took 2nd with Rian Collins from Doherty in the Midlands Region, England/Wales placing 3rd. North America's top placement in this event was 2010 and 2011 North American National Champion Collin Mountain from Richens/Timm who placed 4th. Three other North American boys also placed: Brant Rankin from Mattierin was 7th, Liam Webber from Mulvihill-Lynch placed 8th and Connor Labo from Flanagan-O'Hare took 11th. 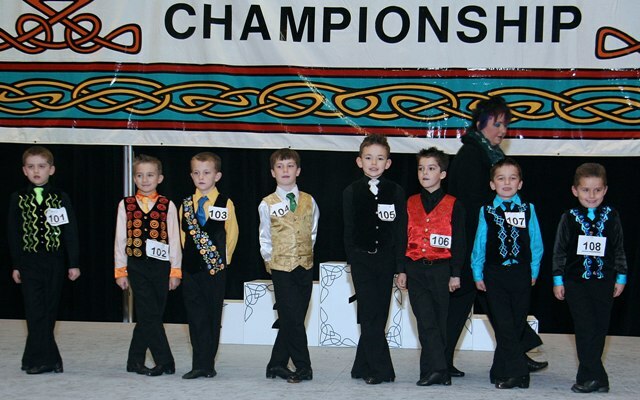 Webber, who has placed 2nd at both 2010 and 2011 North American Nationals, was the 2010 Mid-Atlantic Regional Irish Dancing Champion in Boys under 9. Adjudicators for the Boys 9-10 competition were ADCRGs Des Bailey, Bill Maple, Colleen Mulhern, Pat Brady Mullins and Karen Petri. Heavy round medals were awarded to Jack Lynch, Daniel Donnelly, Cian Cronin, Callum O'Neill, Austin Semple, Collin Mountain, Cathal Doughan, Thomas Comangelo, Joe Flanagan, Sean Slemon and Liam Webber. Light round medals were awarded to Jack Lynch, Daniel Donnelly, Cian Cronin, Ronan O'Connell, Callum O'Neill, Collin Mountain, Cathal Doughan, Rian Collins, Joe Flanagan, Sean Slemon and Liam Webber. For official results, live commentary and photos from All-Irelands, register with www.onthefeis.com, the official partner of An Coimisiun le Rince Gaelacha. Bookmark this page and check back here on Irish Central's Irish dance page for timely updates and news from Dublin all week long!